Experts tell us that if we want things like bridges, parks, public streets and fire departments, then government must provide them. The private sector either can’t or won’t, or things would simply become awful if it did. That conclusion is mostly justified by the theory of “public goods,” for which we can thank Paul Samuelson, the first American economist to win a Nobel Prize. Paul Krugman — another economist and ceaseless supporter of government spending — makes the similar typical claim in this blog post, where he writes that to deny some things must be provided by the government is “stupid,” and to think so you must have slept through Econ 101. By “things the government must provide,” Krugman means everyone being forced to pay via taxation. 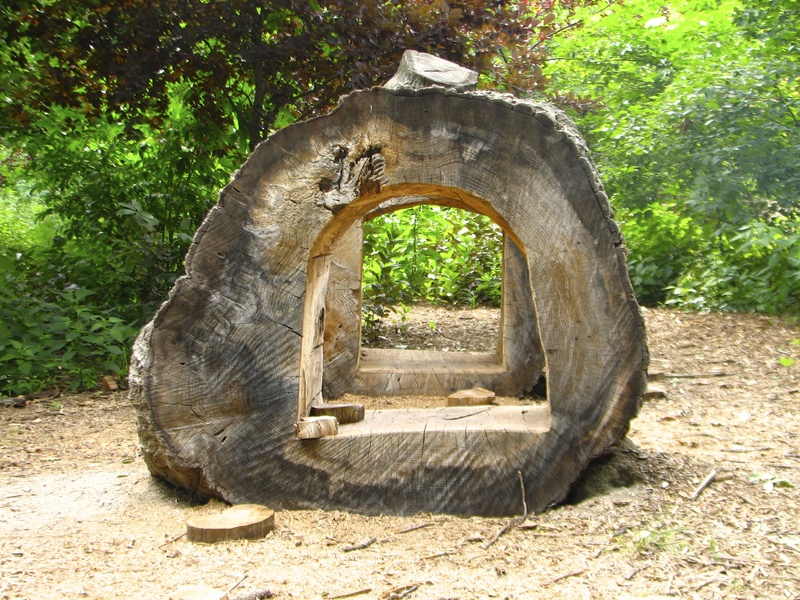 A hole punched through a gigantic log at Kauffman Legacy Park; a private, yet free park in Kansas City. Punching holes in the public goods argument is actually an old sport. In the 1960s, Paul Samuelson cited, in a footnote in his textbook Economics, John Stewart Mills’ example of the lighthouse as something that markets could not provide. This prompted free market economist Ronald Coase to respond with historical documentation of private lighthouses built during the 17th Century in Britain. Since then, people have continued to provide empirical evidence to refute public goods arguments, and cheerleaders for government spending — the Krugmans of the world — have continued to ignore the evidence. But we’ve got to keep showing them. So, I’ve located several things, right here in Kansas City, that stubbornly exist in contradiction to what experts claim and which serve to undermine the case for public expenditure by Krugman, et al. I’ll drive to each one, and document it with a digital camera. I’ll note how far the thing is from my home, and how long it took me to drive to it. After seeing how easy it is to find things experts say you won’t, I hope you want to go out and try it yourself. I don’t have to go far before I reach my first destination. At the end of the cul-de-sac, about 80 feet from my garage door, runs Cedarbrooke Lane. This is a privately owned, public street, despite the fact that even most of its owners are probably unaware of the fact. I roll off the gently sloping suburban curb onto a wide expanse of blacktop. Aside from one shallow pothole to the north of me, the street is in good condition and looks comparable to the city-owned Locust Street, which it adjoins. The street is freely accessible to the general public, as well as US Postal and other service vehicles, so it is truly public in the sense that it is available to all who wish to drive on it, yet it is paid for privately. Such a thing shouldn’t be possible, but here it is. Apart from their being constructed at all, a big concern about private streets is that they might fall into disrepair because the owners can opt to neglect them when money is short. In the face of such fears, it is interesting that this street has existed for forty years and has always been kept in good condition. But how? The answer is that it belongs to a homeowners association. When you buy a home in the Cedarbrooke subdivision, you agree to pay dues for the provision of things like trash, water and landscaping, as well as the upkeep of Cedarbrooke Lane. The HOA has a contractual obligation to maintain certain aspects of the member properties. If a particular homeowner fails to pay his or her dues, the HOA is empowered to put a lien on their property to ensure that it can fulfill its obligations. As a result, not only do the homeowners who together own Cedarbrooke Lane benefit from the street, so does the entire South Kansas City community. If only the public goods argument were in as good a shape as Cedarbrooke Lane. Today it is taken for granted that government must take money from you to make sure someone else doesn’t “slip through the cracks.” Advocates of public social welfare claim that although everyone benefits by not having other people living in squalor, we can’t count on voluntary giving to provide for all who need help. Likewise, they say, private insurance surely won’t cut it because — being profit driven — insurance companies have an incentive not to pay. Yet this Masonic hall (which spookily, doubles as a mausoleum) is a testament to how, for thousands of years, people have found inventive ways of taking care of one another voluntarily. The Freemasons probably originated as a guild of professional stonemasons in the middle ages. Among other things, guilds provided for the families of member craftsmen in the event of the member’s injury or death. Up until the first part of the 20th Century, such societies in America combined aspects of charity and private insurance: members pooled their resources and the organizations used those funds to help members address hardships. The heyday… [of mutual aid societies in America] was during an era when millions of Americans lived on a scale of poverty which would be considered intolerable by today’s underclass. Despite this, millions invested their scarce resources in erecting a vast system of fraternal mutual aid. Although insurance gave some protection, those who subscribed to fraternal societies gained access to services not easily guaranteed in a commercial contract. Today government programs have crowded out much of what these associations once provided. Yet a friend of mine, who belongs to a lodge, tells me that Freemasons still vow to help fellow lodge members should they lose employment or housing. Next time you are shopping for insurance try asking your new agent if he or she will swear to help you out of the next pickle in which you find yourself! Just another chink in the armor of the public goods argument. Of all public goods, my favorite is the park. What would cities be like without them? But who would want a world where every park, if it existed at all, had a tall fence around it forcing you to pay to get in? What about people who could not afford to pay? These questions call to mind the dismal reality envisioned by the Krugman’s of the world if the government doesn’t provide us with parks. So I have headed north and soon I’m in my old stomping grounds — Midtown Kansas City. I’m here to put paid to the supposed rule that parks can’t be private and free at the same time. Amazingly, I find not only a free park, but also a free botanical garden thrown in for good measure. Together Kauffman Legacy Park and Kauffman Memorial Garden span six blocks just east of the wonderful Country Club Plaza shopping district. The park provides outdoor leisure while instilling conservation values by exposing you to the beauty of a native landscape in the heart of a city. Kauffman Memorial Garden is a world-class botanical garden that looks like some medieval nobleman’s courtyard. It’s a favorite for wedding pictures. Both were built in 2004 along with the Kauffman Foundation Conference Center. They are fast becoming two of the most cherished destinations in KC. Amazingly, all of this goodness costs the Kansas City taxpayer nothing, nor are people charged to use either of the two amenities. The Kauffman Foundation pays for these public amenities the same way it funds educational programs promoting entrepreneurship among disadvantaged youth — via voluntary contributions. Krugman’s looking tired. Maybe he should take a walk in the park. As usual, as I drive today, I am listening to KCUR – 89.3 FM (Kansas City Public Media). The uniqueness of American public radio is underappreciated by libertarians: Whereas in most Western countries public radio is paid for via some sort of tax, in America, only 16% of its funding comes from government while a huge 39% comes from individual donations. The rest largely comes from charitable foundations and corporate benefactors. With such minuscule public funding, America’s public radio demonstrates that yet another public good arguably refutes what prevailing theory asserts about it. Libertarians should make a point of contributing to public radio so as to raise the percentage of private funding even higher. We could easily see the day when all funding from taxation could be eliminated with no negative repercussions. By eliminating government involvement, NPR (National Public Radio) would only become more independent — and more secure: While the experts insist that the only way to guarantee the independent voice of public broadcasting to Americans is for government to provide it, according to NPR’s website, individual contributions are the most reliable source of funding in hard times! Public radio gets my gift of support again this year. Paul Krugman gets a lump of coal. Chances are you feel safer at the grocery store or out on the town in recent years than you previously did. Well it’s not because we have more municipal police on the streets, but rather because we have more private security. Police are one of the standard examples cited as a public good not producible on the market. Yet more and more, police forces are being supplemented by private security officers which can stand guard rather than simply respond after something bad happens — too late to help the victims. Private policing has annual revenues over $52 billion with the industry employing 1.5 million people. In contrast, public police spend $30 billion with a workforce of approximately 600,000. How is this possible? Stores and entertainment districts have an incentive to keep patrons safe as well as to protect their own property. Similarly, homeowners associations can better support property values by providing a safe environment while spreading the cost among the property owners. Just as with the public street I mentioned earlier, it won’t matter that non-residents benefit: if an HOA-contracted security service happens to deter rapists or muggers, thus protecting joggers in the surrounding neighborhood, it won’t cost the HOA any more. So spill-over effects — what Krugman referred to in his blog post as “benefits not captured by the market” — are not the big problem experts claim they are. It’s a good thing that people who are not the intended objects of protection nevertheless benefit from the deterrence that protective services provide, and it won’t reduce the amount of services employed. 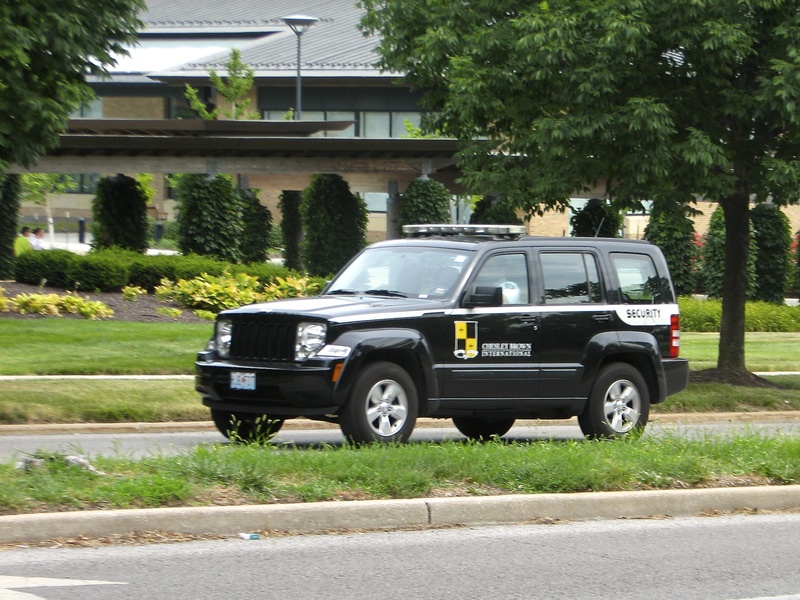 I chance on a good shot of a security vehicle. Judging by its proximity to both The Plaza and the Kauffman properties, I imagine its driver is probably patrolling for one of those organizations. Nevertheless, people who live close by benefit from the deterrence the roaming vehicle provides. Yet that fact has not stopped the client organization from contracting with the security company, despite what public goods theory predicts! As with parks, museums are things we’d like folks not to have to pay for since we want as many people as possible to consume the knowledge and culture that such institutions conserve and expound. We want that because it betters our society. But art is expensive, and so are the museums that house much of it. Cities like St. Louis, Chicago, and New York subsidize the expense so as to allow everyone admission at no cost. Like free parks, free museums fit the description of a public good to a T, because, by their very nature, they are non-excludable making them difficult to pay for. If the experts are correct, it must be necessary to publicly fund art museums, as the cities listed above do. Except that that’s not what happens in Kansas City, where not just one, but two exceptional museums, not far from each other in KC’s Midtown area, defiantly remain privately owned, but nevertheless, free to the public. The world renowned Nelson-Atkins Museum of Art has been around for 80 years and never cost the Kansas City citizenry a dime, either in taxes or entry fees. Likewise, the Kemper Museum of Contemporary Art has not charged for use since its opening in 1994. These museums — massively expensive as they are — are entirely funded by voluntary contributions: Large sums pledged each year by the well-to-do and corporate sponsors, and small gifts of dollars and loose change contributed by the people who give at the door. The public goods argument belongs in a museum — a history museum. In some of the cases presented above, the difficulties for the market with regard to public goods was easily overcome — in hindsight. To paraphrase a response by Richard Dawkins to skeptics of Darwinism, an appeal to your personal incredulity is not a strong argument against the market. The fact that economists sitting behind a desk or scribbling on a whiteboard can’t imagine how the market will get something done has nothing to do with whether it will. But in the examples I found, it wasn’t always the market that got the job done: sometimes it was just good old civil society — the private sector rather than private enterprise — and always the result of human values, choices, and actions. In either case, government and taxation were not necessary. As for cases where charity and philanthropy are the vehicles for providing public goods, one reason public goods theorists get it wrong, and assume people won’t do enough, is that they over extend the classical economist’s model of the self-interested rational actor, homo economicus. That model helped illuminate the actions of the “businessman” as Ludwig von Mises explained; but taken more broadly, it’s a bad caricature of a real human being. Unlike homo economicus, who wouldn’t lift a finger if it wouldn’t increase the value of his bank account, real people donate to help others or to fund a community undertaking they want to see accomplished. When they do, it is because they value others being better off or the success of a project, more than they value the money they contribute to that end. But in order for people to voluntarily contribute to make society better, they have to have enough left over after other things are paid for. Since taxation reduces people’s expendable income, every government-provided public good reduces people’s ability to help voluntarily. Go out and find your own examples of privately provided goodness and punch some more holes in the the public goods argument. It’s fun and all too easy! Ian Huyett, for introducing me to the concept of mutual aid societies. Jeffrey Hull, for suggesting I change “Poking” to “Punching” in the title—just to add a little punch. Erin Skornia, for letting me post photos of her irreverently running in a sprinkler at a cemetery. “Punching Holes in the Public Goods Argument” by Tracey Zoeller , including all photography and illustrations, is licensed under a Creative Commons Attribution 3.0 Unported License. “Krugman Able to See at Last” by Tracey Zoeller is based on a photograph by 00Joshi on Flickr at http://www.flickr.com/photos/00joshi/6331682723/.